Good Governance: Who’s on Your Board Today? Tomorrow? 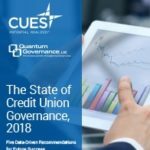 Data from our new report, The State of Credit Union Governance, 2018, finds that the majority of credit unions feel pretty good about who’s currently on their boards—but are much less sure about the future.